The United States, which has extensive coal reserves, will continue to use coal as its primary source of electricity for many years to come. However, today's coal-fired power plants convert coal into electricity with relatively low efficiency. In addition, coal is a source of toxic emissions, greenhouse gases and heavy metal pollutants when used in traditional combustion power plants. For the U.S. to achieve energy independence in an environmentally sustainable and economically feasible way, a clean, efficient and direct process to convert coal into electrical energy is needed. "A proposed energy source must meet strict criteria to overtake conventional coal-fueled power plants," said SRI's Lawrence Dubois. "The conversion system must use a low-cost domestic resource, have comparable or lower capital and operating costs, achieve higher efficiency, and capture fuel oxidation products internally to achieve zero emissions of toxic and greenhouse gases. SRI's novel DCFC approach has the potential to satisfy all of these demanding requirements." SRI scientists are developing a DCFC system that uses inexpensive and domestically available coal for clean energy generation. SRI's Materials Research Laboratory is working with international and industrial partners to demonstrate the technical, economic and commercial feasibility of its DCFCs. SRI's system mixes the best features of two demonstrated technologies: solid oxide fuel cells and molten carbon-air fuel cells. The one-step, clean, high-efficiency energy conversion process transforms the chemical energy of pulverized coal (and other carbon-containing fuels) directly into electricity through the electrochemical oxidation of carbon. The process is 70 percent efficient, double that of traditional coal power plants, according to Larry Dubois, vice president of the physical sciences division at SRI. SRI researchers have shown that in a single step, they can take pulverized coal -- or anything else that contains carbon, including human waste or banana peels, for example -- and directly transform the fuel's chemical energy into electricity by electrochemically oxidizing the carbon. The byproduct is carbon dioxide -- but it is emitted in such a pure form, Dubois said, that it's easy to contain. "If you have a conventional gas-fired coal plant and capture the (carbon dioxide) -- 75 percent of the cost is separating carbon dioxide from air," he said. For now, the carbon fuel cells are producing small amounts of power on the scale of a few watts at SRI's laboratory in Menlo Park, California. But Dubois expects their capability to rise to 10 kilowatts by 2009, to 100 kilowatts by 2011 and to 500 kilowatts by 2015. Unlike hydrogen and methanol fuel cells, SRI’s carbon fuel cells use no catalyst or costly noble metals like platinum. That again cuts costs, and should increase reliability, said Mr. Dubois. Finally, the technology makes it easier to capture carbon dioxide. Current legislation doesn’t require the capture of carbon dioxide, but “the world is going in that direction,” said Mr. Dubois. Such legislation would give SRI’s fuel cells a competitive advantage because sequestering carbon dioxide from traditional coal plants is a complicated and costly process, and SRI could significantly lower that cost, he said. If carbon-dioxide-capturing costs are included, SRI’s technology could cost up to 50 percent less than current plants, he added. That could also assuage some environmentalist concerns, as no carbon dioxide emissions would be released into the atmosphere. 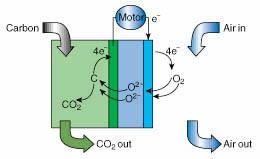 Carbon (C) and oxygen (O2) can react in a high-temperature fuel cell with the carbon, delivering electrons (e) to an external circuit that can power a motor. The net electrochemical reaction— carbon and oxygen forming carbon dioxide—is the same as the chemical reaction for carbon combustion, but it allows greater efficiency for electricity production. The pure carbon dioxide (CO2) product can be sequestered in an underground reservoir or used to displace underground deposits of oil and gas. Cooper explains that direct carbon conversion requires a unique kind of fuel cell. A fuel cell is an electrochemical device that efficiently converts a fuel’s chemical energy directly to electrical energy without burning the fuel. However, instead of using gaseous fuels, as is typically done, the new technology uses aggregates of extremely fine (10- to 1,000-nanometer-diameter) carbon particles distributed in a mixture of molten lithium, sodium, or potassium carbonate at a temperature of 750 to 850°C. The overall cell reaction is carbon and oxygen (from ambient air) forming carbon dioxide and electricity. The reaction yields 80 percent of the carbon–oxygen combustion energy as electricity. It provides up to 1 kilowatt of power per square meter of cell surface area—a rate sufficiently high for practical applications. Yet no burning of the carbon takes place. This sounds almost too good to be true. Electricity from coal without gasification at 70% efficiency. Development has a long way to go, but its worth the wait. Sounds like a great technology to fast track. Why are we we even considering a hydrogen economy? Lawrence Livermore material added on December 4, 2005. Damn, I wished I'd profiled this technology when I stumbled across it a few months ago. Looks like news of it has gotten out. I stumbled across this while researching Zinc-Air fuel cells. It seems John Cooper, the lead scientist behind Lawrence Livermore National Labs' work on zinc-air is also behind LLNL's work on DCFCs. Did LLNL sell their research to SRI I wonder? Is John Cooper still involved or is he cooking up his next big invention? Jessie, I also saw the Lawernce Livermore work some time ago, but passed it up and misplaced my reference, thanks for finding it for me. I still haven't got around to doing a post on the zinc-air fuel cell. There are just too many topics to do everything. "This sounds almost too good to be true. Electricity from coal without gasification at 70% efficiency. Development has a long way to go, but its worth the wait. Sounds like a great technology to fast track. Why are we we even considering a hydrogen economy?" The answer to this question, at least, is relatively easy. Look at the operating characteristics of DCFC: coal dust 1000 nanometers and down as the fuel, and operating temps >750C. Okay for a large-scale fixed-site generating facility, but it's not a transportation fuel. We're still looking for a good way to use electricity as a transportation fuel. Hydrogen is one possible answer to that problem, although I'd be happier if we had a good way to combine water, carbon dioxide and electricity to produce liquid hydrocarbons. MC: I'd be happier if we had a good way to combine water, carbon dioxide and electricity to produce liquid hydrocarbons. How about combining water, CO2, and sunlight to produce liquid hydrocarbons? Nature does pretty well with that. With a small bit of genetic engineering, you could get a lot closer to what you want, without having to modify the natural product very much. Biofuels are a pretty good bet. My question is this: to what extent can carbon fuel cells ameliorate, on a large scale, and in a timely fashion, the enormous power needs posited for the near future? What combination of them and other sources could sustain a viable world economy without the inevitable continuation of the deforestation, co 2 emission issues, loss of arable land to growing populations, unstable political issues (including nuclear etc.) and so on? I'm not an eco-nut, but am deeply concerned that the increasing complexity of the interaction of huge human systems with a degrading biosphere and depleted resources will lead to unpredictable and devastating results. Any good news or ideas? Wittgenstein, you have asked the $64 question. I believe it would be possible to develop a energy system that could be sustainable and not contribute to global warming. It will take a long time, on the order of a hundred years in my opinion. There is enough potential to generate all our electical energy needs from solar, wind and ocean power. The two major problems with this are that these resources are not located geographically so that the power could be generated close to its usage points and that it is too intermittent. Large superconducting grids and massive energy storage could alleviate these problems, both of these technologies are just emerging and will take a long, long time to develop and implement. Some relocation of population will occur as this becomes the most economical way of life. Much better batteries and more efficient production of biofuels are the answer to our transportation energy needs. They are closer to significant usage and could start to be mainstream in 15-25 years, with complete market penetration in 50 years. In the meantime conservation could save up to 30% of our energy use. We probably will have to go through another generation or two of nuclear energy and clean coal power, hopefullly with sequestration, until sustainable technologies are deployed. High efficiency technologies like the one in this post will extend the time that our fossil fuels can be used. In a hundred years fusion power may play an important role. None of this is going to happen on its own. Governments are going to have to take a lead to prevent global warming and economic disaster. Some have suggested that we need a "Manhatten project" to solve these problems. The question is: Can we convince our governments to take sufficient action in a timely manner? Alternatives will be available...but over what period of time and at what cost...we need to do massive investing by private enterprise to explore promising alternatives and then building the infrastructure to turn science into a reality...there is a program out there under a proposed legislative initative that actually makes some sense...(www.usoilindependence.com)...it allows for solutions like direct carbon conversion to possibly get the right funding to reach implementation...check out the sight and let me know what you think. How do they manage trace elements poisoning/pollution in/from the coal? High efficiency technologies like the one in this post will extend the time that our fossil fuels can be used. I hope everything will be fine.